They tell me that one tenth of one percent of the population controls more than forty percent of the wealth. Oh America, how often have you taken necessities from the masses to give luxuries to the classes. If you are to be a truly Christian nation you must solve this problem…. God never intended for one group of people to live in superfluous inordinate wealth, while others live in abject deadening poverty. God intends for all of his children to have the basic necessities of life, and he has left in this universe “enough and to spare” for that purpose. So I call upon you to bridge the gulf between abject poverty and superfluous wealth. (FinalCall.com) - Sworn in for a second term Jan. 21, President Barack Obama again made symbolic history as his inauguration took place on the national observance of the Dr. Martin Luther King Jr. holiday. Debates ensued about the significance of the day and hypothetical questions were raised about what Dr. King would think about the practices and policies of the country’s first Black president. But what is the State of Dr. King’s dream on the day reserved in his honor and as the country approaches the 50th anniversary of the historic 1963 March on Washington later this year on August 28? “Dr. King devoted the last years of his life to challenging economic injustice—including the vast racial wealth divide. His work remains unfinished. 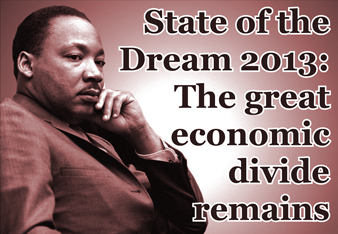 Black and Latino families continue to face significant economic disadvantages relative to White families,” said the 2013 State of the Dream report released Jan. 21 by the Boston-based organization, United for a Fair Economy. The report examines and analyzes inequities in various socio-economic areas and is released each year coinciding with the birth anniversary of the slain civil rights leader. This year’s report, “A Long Way From Home: Housing, Asset Policy and the Racial Wealth Divide,” reflects the continued struggle for true freedom, justice and equality for non-Whites. Calling wealth disparities one of the most constant and damaging aspects of racial inequality, the “immense racial wealth divide is the legacy of White supremacy in the United States,” noted the UFE report. Policies that focus on wealth and asset building and not just homeownership are just one of the recommendations noted in the State of the Dream 2013 report. The continued cries, marches and protests for jobs, justice and true equality Dr. King fought, bled and ultimately died fighting for seems just as elusive today for the masses of Blacks and the poor as it was during the height of the civil rights movement in the 1960s. The Honorable Minister Louis Farrakhan in comments delivered Jan. 1 with staff members of The Final Call newspaper in introducing his 52-week lecture series, “The Time and What Must Be Done,” reiterated the responsibility is on the shoulders of the Black man and woman of America to realize and make a future for themselves and generations to come. “If we understand that we are supposed to be ‘free’ men and women, then we must not act as ‘slaves’—that, as the Honorable Elijah Muhammad taught me, is not good ‘subject and verb agreement.’ We are in the present, and our actions should not be of the past mentality of a slave who sits around begging others, ‘Gimme, gimme, gimme, gimme!’—No! I’m free, now! Let me do something for myself!” said Min. Farrakhan.